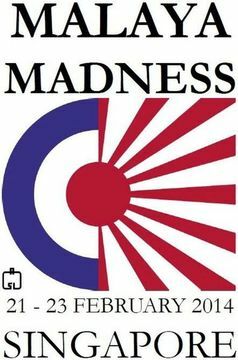 I registered for my first Advanced Squad Leader tournament, the Malaya Madness (Feb 21 to 23 2014) in Singapore. I bought my plane ticket. I booked my hotel. Two months ago I never would have even thought about it. (Flying to Singapore for a weekend to do what?!!) A year and a half ago, Advanced Squad Leader (“ASL”) wasn’t even a blip on my radar. I am writing to you. I know there are a lot of you out there and I care to guess that doing ASL by yourself is not the easiest hobby to do. I am writing to you. I would like to share my rationale for some of the decisions I made along the way. I hope this helps you with your choices. So there I was, working through the Infantry rules in my room, flipping through the massive 2nd edition Advanced Squad Leader Rulebook. I was highlighting important texts and I was noting important ideas in the margin. I was studying hard. When I got tired, I played a few rounds of ASL solo, planning to play through each scenario in turn. Even playing was slow going, I found myself re-reading the rulebook more than I was playing. Question 1: Do I keep on studying the rulebook or do I dive straight into a game? I looked for live games. I found the folks at the Hong Kong Society of Wargamers who have face-to-face (“FtF”) games very weekend. Getting experienced players to take you through ASL games shows you the rules in action. It gives you context. The rulebook becomes much easier to read. Don’t wait to read and study the rulebook and “be ready” before you play your first game. Just go look for live games and attend. I have never met an ASL’r who’s not willing to teach. No, you don’t have the read the whole rulebook. You can start playing infantry only scenarios after Chapter A. Question 2: Do I keep on dabbling solo or do I get on a regular play schedule? I attended live games with the Hong Kong ASL’rs, but I couldn’t have joined them every weekend. ASL was still a solo affair for me. Had it continued in this fashion ASL might have become another of my passing fancies. Out of the blue Don Lazov wrote and asked me if I want to learn ASL from him. I was going to keep my “ASL hobby” on a personal level. but here I was, there’s an experienced player offering to teach. Do I keep it a private & low pressure affair or do I get serious about this? Anything worth doing is worth doing seriously. I stopped thinking and said “yes”. That decision changed my ASL life. ASL went from a private study to a social affair. Playing intelligent and thoughtful human beings makes ASL come alive from that moment on. ASL becomes the complex and rich experience that it’s designed to be. Having a regular play schedule helps me internalize the rules. Question 3: Do I stick with PBeM or do I play live? I play ASL via PBeM using VASL. What I mean is that I play ASL via exchanging logs generated from Rodney Kinney’s “Virtual ASL” platform. I was up to 9 concurrent games at one stage. PBeM saves me from having to be at appointed places at appointed times. With my work travel schedule that was simply beyond the realm of possibilities. I step through my opponent’s moves from the logs they send me. I interject my responses and I send my logs back. What I lost was the social interaction. What I have was perhaps too much time to consider and to reconsider my moves. PBeM games allow for methodical and well thought out games, perhaps too well thought out. So I started having more live VASL games where I see my opponent’s moves real time and we interact via Skype. Often times another friend(s) drop by and it becomes a virtual club night! I still travel as much but I keep a regular live VASL schedule now. My other mentor, Witchbottles, a man who’s a lot busier than I am said it’s a matter of time management. I am learning to play faster. I also learn to give up the notion of playing a “perfect game”. I am learning to square up a situation, structure a solution on the fly and execute! Play, laugh and have a great time. Question 4: Do I stay “in the shadows” or do I go signed up for a tournament? I heard there will be an ASL tournament in Singapore for a little while before it was announced. I have to admit I didn’t give it any thought. The idea of paying for flight and hotel to Singapore by myself just to play boardgames was crazy. I didn’t even join the one in Hong Kong last year (I haven’t turn Fanatic then)! Both of my mentors said I MUST go. One of them had even said in the past that he doesn’t go to tourneys anymore. He said I should go and decide for myself. I gingerly broached the topic with my family. I have to admit, it feels like telling them that I am joining a motorcycle gang. My beautiful family was incredulous at first but quickly came around and gave me the support I need. I signed up for my first ASL tournament. Do I have a chance in hell of winning anything? No, but that’s not the point, although they do have a prize for the one who lose the most games. This is my gesture to myself that I want to do ASL well. Anything that’s worth doing is worth doing well. I might not become a world class player but I want to be wicked good and a lot of fun to play. This is me reaching out and be part of the Asia Pacific ASL community. These are the core group of guys I’ll be playing countless hours of ASL with for years to come. This is me supporting efforts to foster and to grow the Asia Pacific ASL community. Today I already count among my regular opponents, a player from Singapore and a player from Japan. I look forward to a lot more! “Journey to a Tourney” is a multipart series that details my personal journey to what’s hopefully the first in a long line of regular ASL Tournaments in Asia Pac. I hope this will encourage any new or experienced players to come join us as well! This entry was posted in Basics and tagged Advanced Squad Leader, Advanced Squad Leader Rulebook, ASL, Hong Kong, learning, Malaya Madness, PBEM, Singapore, tourney, VASL, wargame. Bookmark the permalink. I go to Heroes when I can in the UK, no flights and not even that great a drive, but due to health I have had to miss the last two years. Hope to get back this year even if I am not up to playing a lot of games. You will learn so very much whilst there and make friends that will last and last. Hahahaha Ian, you are right!! I am going to win the best ASL experience to date. I stand happily corrected. I hope you will get back to the Heroes this year yourself! Thanks so much for the encouragement. .. and yes you are right about Don & Jon. Take good care of yourself Ian. “Ditto” to Ian’s comment on Don and Jon, and to his comment on what you’ll get out of the tournament. I took my 16 year old son to the Nashville convention last year and we both had a blast. Looking forward to going back again this May. I may even try to get to ASLOK this year. Funny thing is, I grew up 30 miles from ASLOK and never attended before I moved away. One suggestion: Pre-Sleep. You’re going to need it. The time will fly by and before you know it, it will be 2am, you’ve played 4 games in the last 16 hours and have forgotten to eat. Have a blast; take lots of pictures. Right … so a big part of my strategy should be energy/sleep management per se, got it. I hope you will get to ASLOK as well this year. I wish I live that close to it! I will certainly keep blogging (and taking pictures) all the way through Malaya Madness. ← What Do We Enjoy The Most About Advanced Squad Leader?